This the Feast of the Epiphany. According to Merriam-Webster, an Epiphany is "a usually sudden manifestation or perception of the essential nature or meaning of something." In this case, it is the essential nature of God's salvation entering into our world as an infant, destined to be King, both divine and human. In our first reading (Isaiah 60:1-6), we hear the visit of the Maji foretold by the prophet Isaiah. Isaiah was writing to the Jewish people as they were rebuilding their city and temple after their exile in Babylon. He offered comfort and assurance that the spiritual city of Jerusalem to come would "rise up in splendor." Caravans from the east would come "bearing gold and frankincense." This prophesy would be fulfilled in the birth of Jesus. 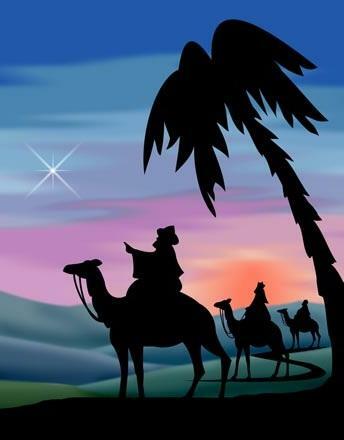 In our gospel account (Matthew 2:1-12), we hear the story of the "Magi from the east" (most likely non-Jewish astrologers of a priestly or noble class) who were following a star at its rising (traditionally denoting the birth of a new king). The gifts they brought signified the nature of this newborn king - Jesus' kingship, his divinity and his humanity. Gold was the traditional gift brought to a new king; frankincense was a perfume signifying deity and myrrh was an embalming spice, indicating Jesus' humanity, that he would die. When Jesus was born in Bethlehem of Judea, in the days of King Herod, behold, magi from the east arrived in Jerusalem, saying, "Where is the newborn king of the Jews? We saw his star at its rising and have come to do him homage." When King Herod heard this, he was greatly troubled, and all Jerusalem with him. Assembling all the chief priests and the scribes of the people, He inquired of them where the Christ was to be born. They said to him, "In Bethlehem of Judea, for thus it has been written through the prophet: And you, Bethlehem, land of Judah, are by no means least among the rulers of Judah; since from you shall come a ruler, who is to shepherd my people Israel." Then Herod called the magi secretly and ascertained from them the time of the star's appearance. He sent them to Bethlehem and said, "Go and search diligently for the child. When you have found him, bring me word, that I too may go and do him homage." In our Epistle reading, (Ephesians 2:2-3, 5-6), St. Paul is very clear in describing his direct revelation from the Holy Spirit that the Gentiles are "coheirs, members of the same body." This attests to the universality of Christ's mission, that Jerusalem's "sons come from afar." Today's Epiphany story is significant in two ways, first, who came to give homage to the Lord and second, what they brought. As a priestly or noble class from the east, the Maji helped fulfill Isaiah's prophesy and signified that Jesus did not come only for the Jews of Jerusalem but for everyone. Their gifts and homage signified their realization that Jesus is Lord of all. We might ponder, what gifts are we to bring to this newborn King? How is it that we prostrate ourselves before him?